A. What is Water Damage? Throughout our lives, we go through some pretty trying things. There are many dangers in the world. These dangers can be toward us, our loved ones, and even our possessions. Life could be a lot better if we could do without these dangers, but they’re always present. Natural disasters can occur, leaving us with losses in both life and property. Earthquakes, storms, and flooding are all ever present. However, they can be small and annoying as well, like a leaky pipe or a hole in the roof. Water damage is something that can plague anyone with a home. It can happen to any home owner or renter—apartment or condo. Trailers can suffer from water damage, too. Most things that get wet can be destroyed by water, but some things are more susceptible than others. A monthly maintenance checklist for your home is a great way to avoid these things, but it can be difficult to tell sometimes. 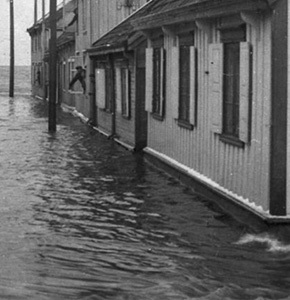 It's always a good idea to have homeowners' and flood insurance. With this guide, you will learn all sorts of things about water damage. These things include how to look for water damage, repairing surfaces of water damage, and more. Restoration is possible when it comes to a lot of things, but some things can’t be saved. It depends entirely on the classes of water damage, which will be explained below. There is also a possibility that the water damage is from “black” water, which is an entirely different sort of damage. At its base, water damage is simply something that has been damaged by water. Seems simple, right? There are varying levels of water damage, though. The true definition of water damage is a bit more complicated. It is basically the wetting or impairment of function or appearance of an item or material from indirect or indirect exposure to water. This can be reversible or permanent. There are different categories of water damage which can be determined if the material or item can be restored or not. Restoration includes getting rid of any mold or other microbial growth, as well as acid residue coloration. 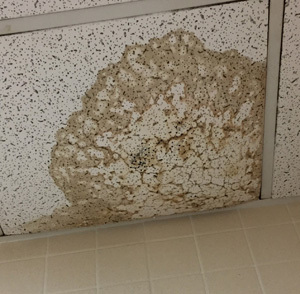 Water damage can affect most surfaces, especially ones that are porous. Things like drywall, plaster, wood, and even some tiles can be damaged by water. According to the American National Standards Institute and Institute of Inspection Cleaning and Restoration Certification, there are four categories of water. It ranges contamination of water, which takes into consideration the source and quality after the water makes contact with the items or materials. This also takes into consideration the health effects and structure that the water touches. Categories can deteriorate to other categories over time. This water is considered sanitary and comes from a sanitary source. It does not have much, if any contamination at all. The water in this category is usually from tubs or sink overflow, damaged water supply lines, melting snow or ice, rainwater, toilet tanks, and appliances. This category is where you will be able to save and restore most water-damaged things. This doesn’t mean that microbes cannot grow, however. The water in this category can be considered significantly contaminated. It can cause sickness or discomfort if you make contact with it. This category can be considered the point at which you will need a professional contractors help with. Water damage here includes washing machines, overflows from toilet bowls, aquariums, water beds, and dishwashers. Things can still be saved with drying and sanitation in this category, but it can be difficult. This is what many consider the “black water” area. This water includes toxic contamination, including pathogens, mold, and other harmful substances. This can be very harmful to humans, making them very sick. This water includes sewage, groundwater, seawater, water from rivers or streams, waste line backflows, and wind-driven rain from storms. Anything touched by these waters will have to be discarded. As you can see, the water damage comes mostly from the contamination of the water. The more contaminated the water is, the less likely you’ll be able to salvage your items or materials. This means that flooding results in a lot of possessions lost and even losing your entire home to it. However, if it’s from rain, humidity, or things like leaky pipes or a hole in the roof, you’re in luck. Then again, you have to act fast, or you’ll have to deal with mold. Whenever water damage happens, there are multiple things that can result from it. If not taken care of quickly or if it’s contaminated water, microbes can grow. This can be anywhere from mold to bacteria. Viruses can be spread as well. The microbes are what cause many of the health problems, which can affect anyone even if they don’t have sensitivities to mold or allergies. Likely one of the most damaging of the microbes that water can supply, mold is harmful and annoying. Mold is a fungus that can affect people in different ways. Respiratory problems are common with mold, leading to fatigue and headaches. People who are sensitive to mold can suffer from nausea, vomiting, and other sicknesses. There are some molds that are worse than others, including the dangerous “black mold” which has even killed people. People have lost their homes to mold in many cases and it can be very difficult to remove. Regardless of the type of surface that has water damage, it will grow if not taken care of swiftly. Regardless of your sensitivity to it, mold is not something you want to deal with. Along with the health problems, it can leave a dirty and mildew smell along the air. There are so many bacteria around, but it can get even worse whenever water is introduced. With nutrients in the water and a warm surface to grow on, bacteria will flourish and cause more health problems. This means that infections become more likely whenever introduced to your body. These can lead to more severe health problems. Sanitization is always necessary when it comes to water damage. These bacterial infections can lead to things like strep throat, sinus and ear infections, and sometimes even death. These bacteria are very serious on top of the other possibilities of mold and microbes. Along with bacteria, there can also be viral infections like influenza. It’s a dangerous thing to run rampant in your home, so getting rid of the water damage is of the utmost importance. While not always on the front of everyone’s mind, pests can become a problem. Weakened walls lead to cracks and holes. These are perfect breeding grounds for some insects like roaches, mosquitos, and more. Water damage weakens foundations, drywall, and plaster. These make the walls soften and weaken which causes the cracks and holes. Of course, this makes it very easy for pests to dig into them and make homes and breed. Moisture also brings about wood rot, which can be even more detrimental to your home. The constant exposure of liquid to your wooden frame can break down the fibers in the wood. This makes more holes for insects to crawl in; especially ones that eat it—namely carpenter ants and termites. Water damage is a serious issue, so fixing the source is where you should start. These items will keep you safe from the microbes and other things. Ceiling damage is a big possibility. This can lead to pieces of plaster or drywall falling onto your head. A hardhat is necessary for things like this. A professional will always be wearing these things when dealing with water damage. If there is any question, always call a professional. There are many dangers when facing water damage, whether it’s in your home or apartment. The microbes can cause you to get sick, as well as anyone else in the home. Restoration is a complicated matter and can go very wrong if you don’t know what you’re doing. Along with these things, if you don’t get to it quick enough, mold will run rampant. There are many people out there who can help you with water damage and mold removal. Mold will spread and is very difficult to get rid of if you don’t get it all. A professional will usually be able to restore items, but it depends on the category of water and its contamination. It’s not difficult to pick up a phone or contact someone, after all! Insurance can help a lot with these things, especially finding a contracted professional. There are many signs that you can look for whenever trying to find water damage. A monthly, routine maintenance check is a great way to spot these signs. They can appear anywhere, be it on the floor, ceiling, or walls. They can even appear beneath the drywall or plaster, so it’s a good idea to check all areas and facets of the home. The signs can be visual or olfactible—that is, seen and smelled. If you can’t see it, you might be able to smell it. As you can see, there are many different things that you can see, hear, smell, and feel. Tasting is not recommended! If you are adamant about keeping your home in tip-top condition, be sure to look for these signs for any sort of damage. Water can seep through a lot of things, so be aware of your surroundings and your home. This area gets a bit trickier than repairing the leaking area. A hole in the roof or a leaky pipe can be fixed with ease. Environmental moisture can be handled with a dehumidifier. How does one repair water damage that has already been done, though? It can be difficult, but it is possible. Unless, of course, there is category 3 water involved. If anything is touched by contaminated water, it must be discarded. It’s nearly impossible to save walls, flooring, or ceiling that has been touched by contaminants. This means any “black” water from floodwater, sewage, or anything else like that from category 3 as listed above. Unfortunately, that also means any possessions that may have been touched by this water. Each surface and material has a different way of being treated, but some water damage can be painted over. There are different types of flooring, wall, and ceiling surfaces that require certain care. Things like drywall and tiles can be replaced, but carpet and wood are different stories. Humidity can be a factor in some of these cases, so some of these can be easy to deal with. The first thing that anyone should do before repairing is to find the water source. This means that you need to repair a hole in your roof, tighten that leaky pipe, or get a dehumidifier. Water doesn’t simply appear, after all! There is some source. Finding that source is one of the most important things you can do. You can’t repair a surface that still has the possibility of water damage. Find the water source and proceed from there. After you find the water source and repair it, the next step is to assess the damage. You should consider what type of water caused the damage. In the categories above, you should be able to discern what type it is. If it’s sanitary water, the most you’ll have to do is dry it and sanitize it if the surface hasn’t been broken. Assessing water damage has become a bit easier as of late, too. There are things like moisture meters and thermal image cameras that help you see the extent of water damage. Any moisture will show on either of these devices. However, it might be deeper than these items can pick up. It’s always a good idea to double check the area. If you’re going to take the repairs into your own hands, there are some things you will need. Tools are necessary to fix these areas, even if they need different methods. These items are necessary, though they’re not the only things you need. Keep in mind that you’ll need the proper safety equipment as well, as said above. Make sure you’re covered up and at least wear a dust mask! Since the kitchen is one of the more common places for water damage, it is a good place to start. The kitchen has many lines of water that run through it. The sink has a water line, as well as the dishwasher and possibly the refrigerator. Sometimes they’re connected with one water line, but each one can have its own individual one. It’s also a bit trickier here, considering that the water damage can get behind the cabinets. If it does get behind the cabinets, it can be a lot more of a hassle to repair. However, if it is simply on the wall around a water line or behind a refrigerator, it becomes a lot less difficult. It’s simply a matter of drying and sanitizing the area. This can be an involved process, but airflow is important. A heater can also help drying the area, but sanitation is necessary. In order to get the most out of your sanitation methods, you have to sand the area to get to the wood or drywall. After sanding it down, dab the antimicrobial liquid with a sponge or brush to the point it gets into the pores of the surface. Brushing the liquid will seep into the material and will kill any microbes that may have gotten in there. Afterward, make sure to let it dry once more with airflow and a heater. This should take care of any mold or bacteria that could come from it. 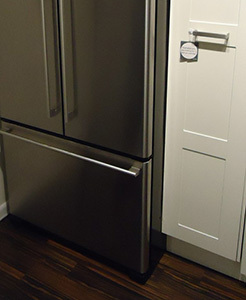 If the water damage is behind a cabinet, it can be a lot harder to replace the area. First and foremost, you have to take the cabinet from its place. That means you have to remove the caulk, unscrew any holders or fasteners, and more. If you are unsure of how to do this, be sure to call a professional. Cabinets can be removed, but it can cause serious damage to your walls or the cabinet itself. If possible, you may be able to create a hole in the back of your cabinet to get to the water-damaged area. Using your fan or air mover, you can attempt to dry the area with it through the hole. Of course, you’ll have to sanitize too, so be sure that you can get to the affected area with your hands or brush. Make sure to use your moisture measuring device or thermal camera to see if you removed all the moisture. Whenever the water has expanded farther than a few inches, you’ll likely have to remove the entire cabinet. They can be pulled away, but as said above, it can cause a lot of damage to it or the wall it’s connected to. There are many people out there that can help you remove it, so don’t be afraid to call a professional. Similarly to kitchens, bathrooms are another area of the home that is more likely to get water damaged than others. However, the methods and process is very similar to a kitchen’s repairs. The thing with bathrooms is that it’s possible the water damage is category 3, or “black water”. Considering sewage is in category 3, it’s very likely you’ll have to replace the entirety of the affected areas. This includes both walls and flooring. Heavy sanitation is recommended. Of course, it is entirely possible that the water is coming from the main water line. If it is, then that water is considered category 1. This water is sanitary and can be simply dried and disinfected to make sure mold doesn’t grow. 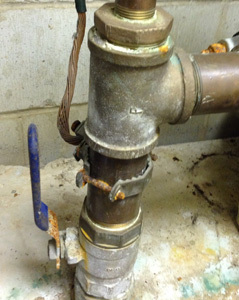 Not too much has to be replaced and it can simply be dried if you have stopped the water source. However, depending on the flooring, it might be a bit more difficult. Normally, bathrooms have ceramic, porcelain, or even vinyl tiles. Some even have plastic laminate over them. These types were made specifically with water damage in mind. A simple scrub and disinfecting can be enough for bathroom tiles. Then again, if they have multiple layers or creases, you’ll have to lift the tiles to get under it and on the sides. Drywall is what most walls and ceilings are made of now-a-days. This surface can be porous if they’re not laminated or sealed, making it susceptible to water damage. These walls and ceilings will possibly show those brown, blotchy stains. The main reason for these stains is water damage. There is a chemical in paint that is activated by water, causing it to pool on the ceiling or run down the walls. This material is relatively difficult to repair with drying. In most cases, it is simply easier to cut out the drywall and replace it with new drywall. It involves a bit of cutting and measuring, but it’s not as hard as it sounds. After measuring specific areas, you can cut some off the new drywall slab and simply screw it in. Construction adhesive and masking tape are great here, so just plaster it on and paint over it! It’s as simple as that—if you’ve fixed the water leak, of course. Drywall is a good material considering it’s easy to cut through if you need to repair it. It can be as big or small as you need it to be. This material can be cut into squares and placed into the areas that need it. Making patches is easy enough, but you should still be careful when using saws and cutting tools. It can also be difficult to tell how far the moisture has spread, so use your moisture measuring tool and thermal camera thoroughly. Plaster isn’t so different from drywall, to be honest. This material has been used ever since ancient times, but technology and surfaces have been improved. Most plaster is three-layers deep, but water damage can go through all of them. 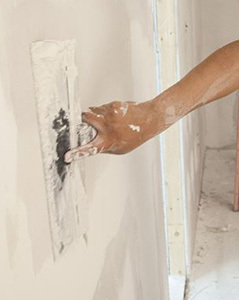 Similarly to drywall, it can be a lot easier to simply remove any loose or damaged plaster and replace it. Using a putty knife or any sort of flat-edged tool, you can scrape off the plaster and any underlying water damage. After that, all you have to do is apply new plaster and sand it down after it dries. Painting it afterward will hide any sort of damage that may have been done. Plaster can get messy, though, so be sure to put a tarp beneath. If not, you should vacuum up the pieces afterward. It is arguable that plaster is easier to repair than drywall. Because plaster is made from mixing the material, you can create as much as you need to instead of cutting it like drywall. After having mixed the plaster, simply smearing it onto the damaged area is the best method. This means that you don’t have to worry about cutting specific areas or measurements. Flooring is a bit harder to specify, considering there are many different types. 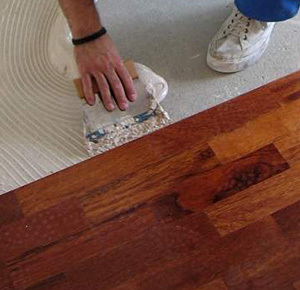 The bottoms of your homes can be made of wood, ceramic, porcelain, marble, carpet, laminate, or even bamboo. There’s more than that, but those are the more popular kind. Each one of these things require different methods of cleaning, especially carpet. Below are a few different ways to clean from water damage. A couple of them you won’t have to do very much, but each one has its own signs of showing water damage. Carpet: Brown spots, discoloration, and odors of mildew or mold. Laminate: Warping and swelling, meaning there are areas that are not smooth and either rising or bunching up. Tile: Loose or broken connections, detached from adhesive, making a hollow sound if tapped with a metal object. Wood: Dark or discolored areas, raised edges known as “cupping”, and loose planks along the floor. Most of these flooring types require cutting into the floor, which can be difficult to do with things like marble, porcelain, and other hard tiles. Get a professional’s help if you’re unsure of what you’re doing. You could damage a lot more than your floor if you don’t take safety into consideration. After cutting out the affected area with a 1” saw, check the subfloor. If the subfloor is wood and is affected, you’ll likely have to replace that too. Cutting into that and replacing it is a must, otherwise you risk mold and mildew. If it is concrete slab, all you have to do is scrub it down with those antimicrobial liquids and let it dry. Carpet usually has a pad or cushion beneath, which also needs to be replaced if repairing. Wood is a bit different than other possessions around the house. If it’s furniture or laminate flooring, it’s possible that your wood won’t get water damaged at all. This material requires a coating of sealant, usually made of oil or some other coating base. Waterproofing wood is very possible and should be done to your flooring, wooden furniture, and outside decks. This will prevent water from getting in and protect wood from water damage. However, waterproofing liquids can deteriorate over time. It takes a while, but it’s possible. Reapplying the coating every once in a while can help a lot. It’s also a good idea to get some tinted waterproofing sealant because it will protect the wood from sun damage as well. It is ideal to protect your wood from both of these sources. Wood is a porous material that absorbs water rather slowly. Depending on the type of wood, whether it’s hard or soft wood, can mean there is more density. The more density there is, the slower the water will absorb into it. Most furniture pieces are already coated with a fine finish of sealant, but as said before, it can deteriorate. It’s possible to scrape off the inferior coating and use your own, however. While there are many possessions you can save, it can be somewhat difficult to save books. Many people have libraries in their homes that have priceless or irreplaceable books. Paper and other things like this can fall under this area as well. It’s a long, tedious process, but it can be done. Books can be salvaged, so don’t toss them away if they’re wet! Many restoration processes depend on how wet the book is to begin with. It also depends on how many pages the book has, considering that thicker books will take longer to dry. Usually the amount is above or below 500 pages, according to River Campus Libraries. This will determine how you will need to dry them. The thinner it is, the easier it will be to dry them. Do not open or spread the book. Wrap the book in plastic sheet and unprinted newspaper or other absorbent paper you have. Stand up the book on its top or bottom to let the water drain away. If the color is bleeding, you can wrap it in aluminum foil rather than paper towels. Keep the air circulating with the fan or air mover. It’s a good idea not to aim it these air movers directly at the books. Whenever the books have drained enough, you should put them in a freezer and freeze-dry them. This prevents mold and mildew from growing on the books. It’s a good idea to put them in fast-freezing areas which range from -15 to -20 degrees Fahrenheit. It is unlikely that there are any home freezers that get this cold, so you may have to bring them to a professional in plastic crates or cardboard boxes. Whenever they are frozen and you are ready to dry them, use the vacuum freeze-drying method. This is the method you should use because frozen water skips the liquid state. That means it becomes vapor and it will protect your ink and pages. There are even professionals that can help you with this, so if you don’t have a freezer cold enough, call someone to help you. Use the plastic sheet and absorbent paper like before. 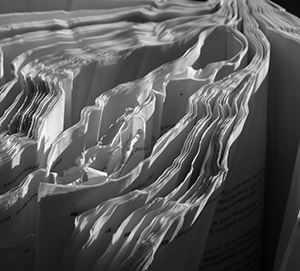 Put a paper towel into every 18-20 pages and lay the book flat. After about an hour, the paper towels should have absorbed enough of the water to stand the book up and fan it somewhat. The book should be less damp, so you can proceed to the next stage. Use more of the plastic sheets and absorbent paper beneath it. Stand the book up and fan it, using the air movers and fans and let dry. It’s a tedious task, but if you have books, it can help a lot. These methods may not work on all books, especially ones with water soluble components. Also, if there is category 3 water involved, it’s quite likely that you won’t be able to save it. A professional may be able to restore it in this case, but try to save any book that might be ruined by black water. Never underestimate the power of thoroughness. If you are very thorough and diligent, you will be able to restore even the wettest book without much wrinkling or bleeding ink. However, if you take too long, a book will not be able to be restored. Mold will grow between the covers and it will be ruined. Books can be incredibly heavy, though. Never put yourself in danger to save a possession! Sometimes, our photographs are all we want after a disaster. These glimpses into the past can strike fond memories of family and fun. It can be so saddening to find that your pictures may have gotten wet from something, whether it’s humidity, a flood, or any sort of disaster. It can be a big loss, but thankfully, photos are restorable to a point. Water damage usually comes in the form of dirt and grime on the photos. Luckily, technological advancement has proven that photographs are a lot sturdier than they were before. Whenever a photograph is damaged by water, there is still a chance to save it. As always, you must work quickly, otherwise the photographs can get ruined by sticking to other things. Funnily enough, water is a photograph’s best friend whenever it comes to restoring them. Make sure they don’t dry to the surfaces they’re pressed against and treat them very gently. If they dry to surfaces, the emulsion could peel away when taking the photos away. Put your photos in cold, clean water and let them sit there. Leaving them there is fine until you get to each one individually. After they have been in the cold water for a bit, use a sponge or cotton ball to gently dab away any impurities from the photos. If necessary, very gently separate the damaged photos from the surfaces they’re applied to. Remember, if you’re rough with it, it can cause irreversible damage. After removing any impurities like dirt and dust, hang them up to dry. Make sure that they are not subject to dust in this area. If the photos curl after drying, all you have to do is use the sponge or cotton ball and wet the back of the photo. Place the photo between two pieces of acid-free paper and set something flat and heavy atop it. This guide is all about water damage. If you can take anything from it, remember that you must take care of water damage as soon as you can. Leaving water damage for later will be detrimental to your health and the home itself. Mold can grow and it can weaken the structural integrity of your home. Water damage must be taken care of immediately. Any surface or possession can become water damaged. Many of these things are restorable if you get to them quickly enough. However, depending on the type of water it is, things may need to be discarded. Floodwater, groundwater, and sewage water are types of water that you can’t save things from, though. There is so much contamination in it that even more dangerous microbes can grow in it. Depending on the category of water, you should be able to restore anything that is touched. When repairing water damage, you must always sanitize afterward. Sanitizing removes any possibility of microbes growing, but there can be a lot of work involved. If you’re ever unsure, there are many people out there that can help you. Call a professional if you need help!